What is a victim? A victim is powerless. Tim and his mother met with me because he was struggling in his classes. A gifted fifteen-year-old with great potential, Tim leaned comfortably against his mother as she ruffled his hair with her fingers. His father traveled extensively on business and was seldom home. Tim sunk against his mom as she spoke about his many limitations and disabilities. I turned to him to ask his opinion about what was going on in school, and his mother answered for him as if he was unable to communicate. He seemed relieved that she was answering as we tried to problem-solve. I’d never seen a mother and son sit so close to each other; she was almost propping him up – and he was shrinking before my very eyes. As I watched this dance, I wanted to grab Tim by the shoulders and sit him up straight in his own chair away from his mother. My heart started beating faster as I heard the litany of problems – physical and emotional – that his mother listed as he mutely listened to her, but he appeared to be smiling ever so slightly. He seemed almost pleased that the conference was going this way, and I don’t think this was the first time. How many times had Tim heard his mother list his supposed shortcomings? How many times had he smiled as he listened to her? I felt sickened that she was keeping him from his great potential and independence. Help him feel what success feels like. Let him achieve success on his own. 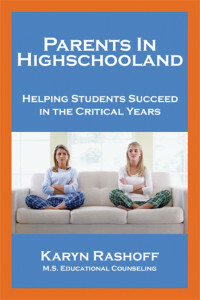 Have realistic expectations and support both the expectations and your teen. Don’t set your own expectations so high that you set him up for failure. Talk with your teen about his passions outside of school and perhaps volunteering. Involve your teen in a self-esteem character building activity where he experiences a sense of accomplishment along with the joy of recognition. Parent involvement is very important in reinforcing and supporting your teen’s dedication. 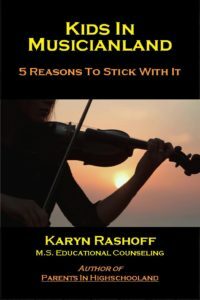 This entry was posted in Stories from the Book, For Parents on May 2, 2016 by Karyn Rashoff. Don’t let your children believe that your love and approval depends on their grades, athletic ability, or success. They need to be successful in their own right, not because you need to validate yourself. Be their biggest cheerleader, staunchest advocate and strongest support system. Love them unconditionally for who they are, not for what they accomplish. Make time for them to download their day to you. Having time to connect with them every day involves you in their lives and helps prevent unexpected bumps in the road. Give your kids as much trust as you can – and lead by example. Teach your kids that everything in life doesn’t come to you naturally. Inspire a sense of values, work ethic and motivation – despite the obstacles. If they come to believe that you trust them, they’re more likely to live up to your belief in them. Set limits on their use of technology: the vast majority of homework doesn’t need a computer. Create a quiet space for them to do their homework away from the TV and other distractions. We are what people think we are. The child who is convinced that trustworthiness is a positive value is likely to be trustworthy. Put them with kids who are headed for achievement, then back away a little. Create time for your child to be successful without burning her out. Keep it simple, and don’t push.